16th-Apr-2019 09:59 pm - Update on Conciousness Stream. Prom was a success. C now plans to go to a total of six proms before he graduates. County Fair was accomplished. The kids went on many rides. M got me a bracelet. We got wooden name signs made for the nieces and nephew. Gaming day happened at the gaming store. Friday I have to figure out if the gaming store will be open next week, and if not, if the mother who offered to host can still host. S has decided for the first time since she was 12 to not cosplay at a Con. She's too burnt out from all the busy to want to bother. It doesn't help that she'll miss half of Saturday because of her ceramics class. H got all her requested days off, though, so she'll be able to attend the whole weekend. 12th-Apr-2019 03:18 pm - Stream of Consciousness. I still have to figure out if the gaming store, we meet at every week, is closed next week to resurface it's floors. That one is challenging, because I have no real control over when it happens or even how much advanced notice I'll have for when it does. One of the Mothers of the group offered to host at her house as an alternative, and while wonderful of her to do it, it leaves me with one more person counting on me in a situation where I basically have zero control. I really need to clean out my car before hauling three kids to prom tomorrow. At least it's far less of a herculean task than when they were all under the age of 10. Maybe I can convince hubby to come with and we can have an actual date night. Next weekend is LepreCon and Easter. 8th-Apr-2019 01:52 pm - Hot Lemon Honey Water. Fill small mug, 3/4 full, with water. Nuke for 1 minute. Squeeze in juice from 1/4 lemon. Add in small spoon full of honey. Stir till everything is dissolved and evenly mixed. I ended up making two batches of that at four in the morning after being woken up by the boy complaining that his neck hurt like crazy, but he couldn't say exactly where. Given the confusion of unexpectedly finding myself awake in the middle of the night, and C's initial inability to answer questions like, "does it hurt to swallow?" with useful answers, I defaulted to going outside to pick a lemon and make him some hot lemon honey water. It helped him a little, and eventually I woke up enough to figure out how to ask better questions to narrow down the most likely sorce of his pain*. This morning he woke up generally sick, but in better spirits. Plus, the specific pain had subsided. *It didn't hurt when he clenched his jaw, it wasn't originating in his ear, it was the spot on the neck directly below the jaw line that I associate with "swollen glands". It helped C relax more, once we could rationally identify the likely culprit, so once he finished his hot lemon honey water, he took a shower and put himself back to bed. 1st-Apr-2019 03:08 pm - R.I.P. 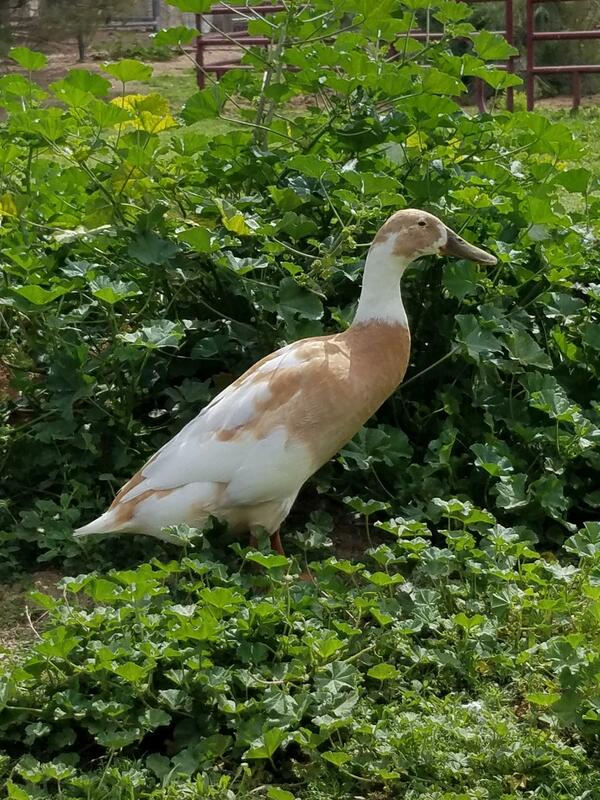 Our oldest duck, Fang, the fawn and white runner, died this morning. It's sad, but did not come as a total shock. She had been slowing down over the past week. 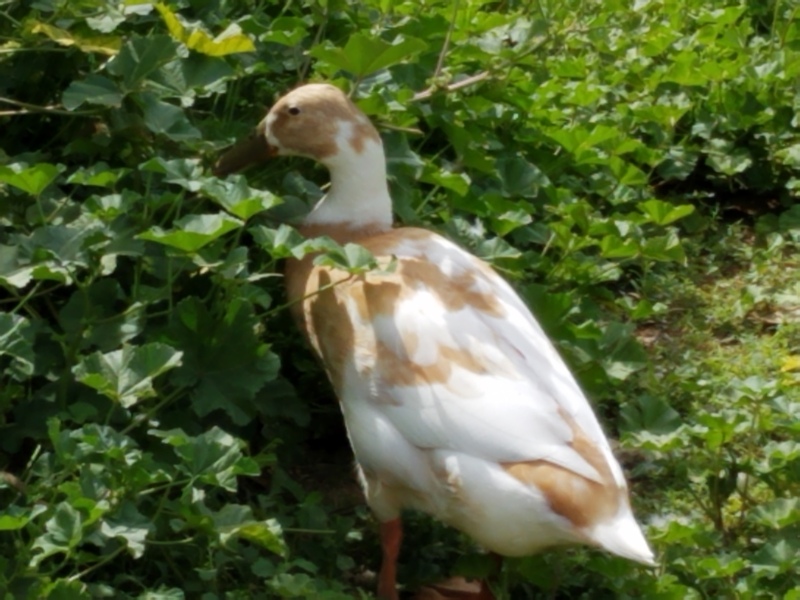 She was the last of our ducks born before the great duck slaughter of 2015. Baby pictures from Fang's first week. I snapped some pictures of her last week, since I had a feeling I might be writing one of these posts soon. 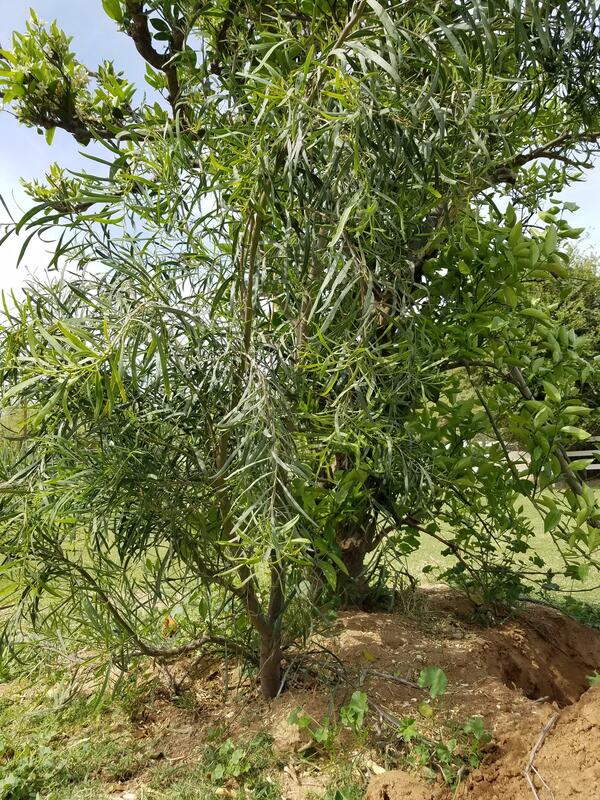 We buried her by a volunteer tree. S brought Wobbles over, so we showed him the body. He hung around for the ceremony, splitting his time between talking while standing near the edge of the hole, and cuddling with C.
Fang attached herself to Wobbles when she was the only duck left. He accepted her as one of his girls. She used to yell at him if he wasn't where she wanted him to be, then seek him out to get him moving in the right direction. It was thanks to their relationship that Wobbles' geese and the ducks are an integrated flock. 29th-Mar-2019 12:36 pm - Two Fun Things. A couple days ago Mike Pence announced the intention of our government to get people to the moon by 2024. After scrolling past the headlines complaining about this idea being risky, unrealistic, and ludicrous, I found this article to share for anyone interested. And on a far more personal note, one of my tweets was read on the The Pat Grey Unleashed Show today. Check out from 21 minutes in. Squee! 28th-Mar-2019 08:44 pm - Random Park. Yesterday the boy said he needed more social. Tonight, after his karate class, he managed to spend time playing with two separate, random sets of kids, with a brief break in between swinging with me and reminiscing about different swinging styles and games from his younger years. I love how friendly this latest batch of chickens has become. All I have to do is sit down in their yard and they'll come over to beg for treats, peck at my clothing hoping it's food, and generally hanging out nearby. Okay, so maybe their true motivation is their stomachs, but they do all this near us, so we can anthropomorphize accordingly. Several weeks ago they all became outdoor only. Hey Hey was the last holdout. It took H putting her on the roost one night after a kerfuffle in the house for it to click in her head. 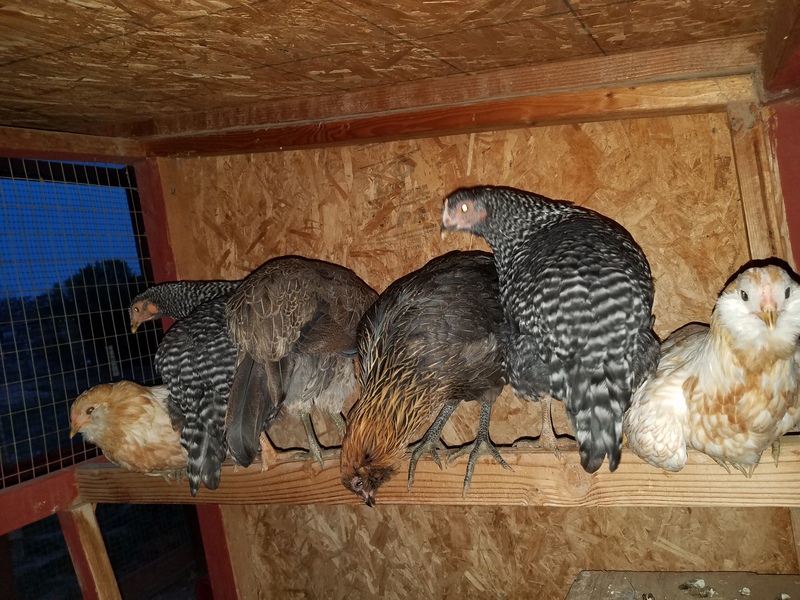 Every night since, all six babies have roosted properly. We now always leave the door between the duck house and the exercise yard open. The ducks usually muck up one of the chickens' water buckets with this setup, so at night I leave an extra bucket inside the chicken house where the ducks can't reach. Every morning it has become the routine to let the chickens out through the exercise yard door and give them full access to the chicken/duck/goose yard for some running around and nomming on weeds time. They cluster at the door as soon as they see me coming. It took the ducks longer than you might think to figure out they could let themselves out that way too. 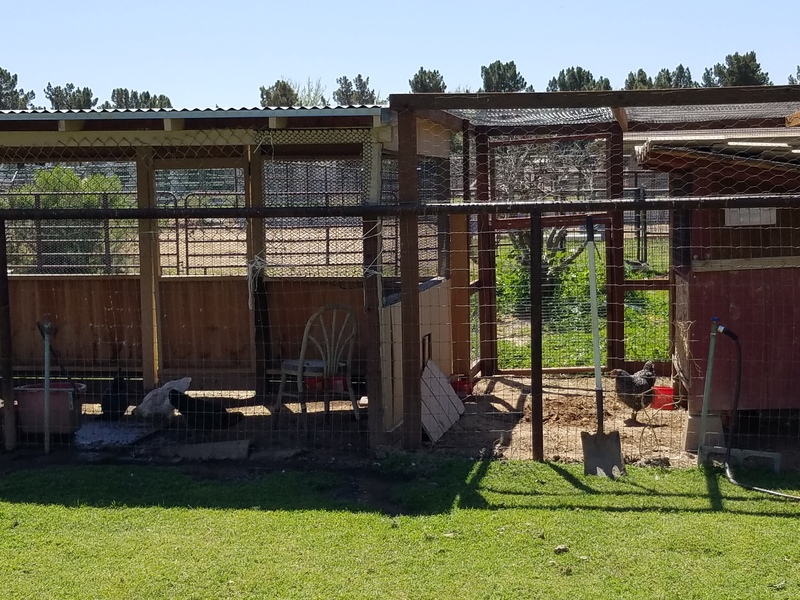 The rest of the time we keep the chickens locked in the duck house/exercise area to protect them from hawks and owls, though sometimes C lets them out and hangs out with them for a while. 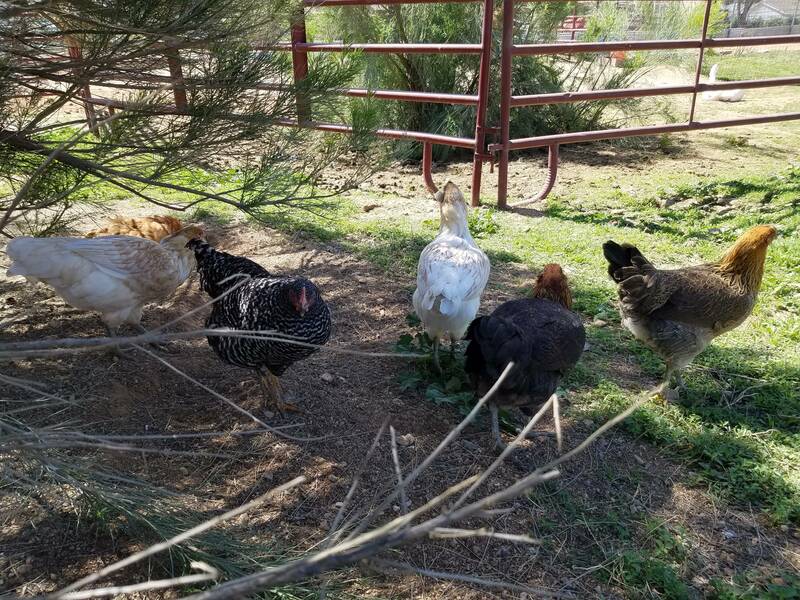 The chickens are surprisingly easy to herd when it's time to shoo them back in. 27th-Mar-2019 12:06 pm - Well, it's Official. Spring is trying to kill me. PS. This is just me wanting to whine about it, I'm not looking for solutions. I'll muddle through like I always do. Muddling will just include a fair bit of sneezing, sniffling, itchy eyes, and general blurriness, until the worst is over. 24th-Mar-2019 01:36 pm - German Pancakes. 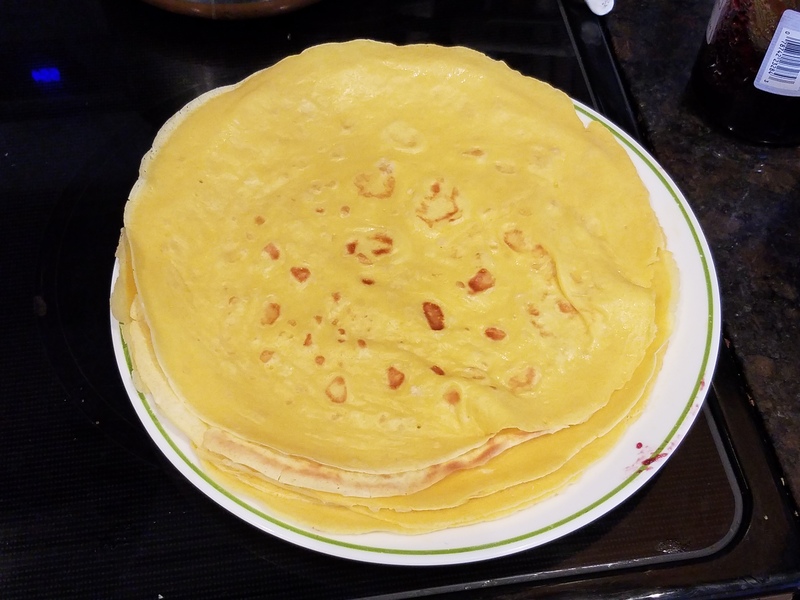 I have no idea if the origin of this recipe is actually German, they were, however, called German Pancakes by my Mother, and, as I learned how to make them from her, I continue to call them by that name to this day. A little butter to cook them in. As this is one of my Mother's recipes, the proportions are not precise, more of an until it looks right sort of thing. Basically, it's one heaping scoop of flour, to some amount of milk, to one egg. Increase each part as necessary for larger batches. I tend to do a minimum of 5s*, but this morning I made three batches of fives for the family. Heat a pan over medium heat while you prepare the batter. Make sure to mix the milk and flour together before adding egg(s); this will keep the batter from being too lumpy. You'll know you've added enough milk once it looks like paste or a little thinner. Then add the egg(s). Once completely mixed, the batter should be a thick, but pourable, consistency. Add a little butter to the center of the hot pan, then pour some of the batter into the center of the melted butter. Pour enough to be able to tip the pan and spread out the batter to the edges. More batter equals thicker pancake, less batter equals thinner. Adjust the amount of batter for your preferences. After a few minutes, once it looks like the pancake is no longer liquid, flip it and cook on the other side. There should be some golden brown spots on each side of the pancake when you're done. If you flip too soon, just flip it back later to finish up on the first side. Once done, we spread backberry jam on the pancake and roll it up. Sometimes they are rolled up and eaten plain. When I was a kid, sometimes we added honey. *For egg amounts, since we have different types of laying birds: one chicken or small duck egg equals one, two large duck eggs equals three, one small goose egg equals two, and one large goose egg equals three. I will use a mix of whatever is available to total the proper number of eggs for each batch. 20th-Mar-2019 12:00 pm - Random Gratitude. I love looking out my back door and seeing green. Having flood irrigation is amazing. · Update on Conciousness Stream. · Hot Lemon Honey Water.